Yesterday I met a couple of photographers at the PPI Fall Seminar. Don't worry, the place was actually full of photographers! I just had the opportunity to have more in-depth discussions with with a couple of them that I hadn't met before. One from Iowa and the other from Missouri. I look forward to connecting with them again soon. Hi Amanda & Julie! Today I spent more time with the kids (after fighting off a migraine this morning). They didn't have school today. Of course my time at home included some editing. 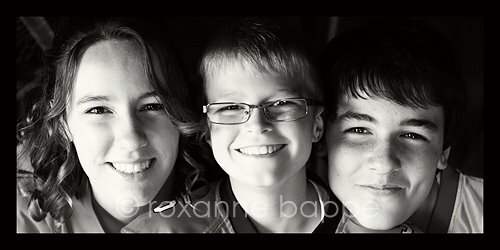 Here are three fun kids! One you will recognize from the senior session earlier this fall. We just added her brothers to make three!